CURRENCY: Eastern Caribbean & US Dollar. TIME ZONE: GMT - 4 hours. VISAS: Visas are not usually necessary for British passport holders. VACCINATIONS: No compulsory vaccinations, however, Hepatitis A, Polio and Typhoid are recommended. Please consult your G.P. before travelling. St.Kitts is just 68 square miles, and the interior is dominated with rugged volcanic peaks sloping down into fields bright green with sugar cane. Many of its beaches have grey, volcanic sand, although Frigate Bay, the main resort area on the island has a lovely golden stretch of beach. Basseterre, the small capital of St. Kitts, is a charming town where echoes of the island's past association with Britain are abundant. A Victorian clock tower rubs shoulders with stone Georgian houses, old church towers and the 19th century Treasury building on Bay Road. Visit Brimstone Hill, one of the most impressive hill forts, for a magnificent view of neighbouring islands. Nevis, the 36 square mile sister island lies close by, separated by a channel of sea just two miles wide. Charlestown, the capital of Nevis, boasts numerous 18th and 19th century Georgian style buildings, most built of stone on the ground floors and wood upstairs. These lush green islands in the Eastern Caribbean are tranquil and un-commercialised, and have maintained an easy-going, unspoilt way of life. And yet nature is only a small part of the wonder of these small, relatively undiscovered destinations. Long ago, St. Kitts and Nevis were the pearls of the British Caribbean, rich and enormously important islands that were celebrated throughout Europe. Nevis, the "Queen of the Caribbees," possessed unimaginable wealth from its super-productive sugar industry, while on St. Kitts the impregnable fortress of Brimstone Hill stood as the Gibraltar of the West Indies. 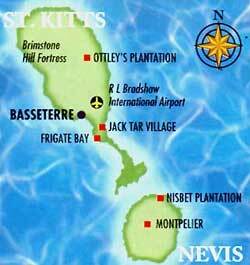 Nevis was the setting for the romance of Horatio Nelson, who met, courted, and married Fanny Nisbet.